The task overview shows all the current tasks. 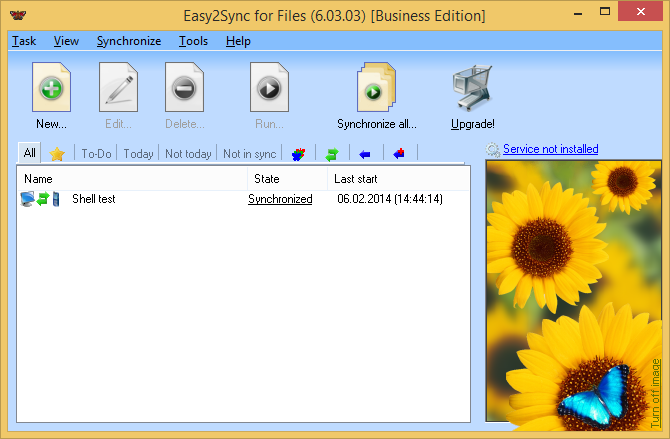 You may separately select the different tasks and execute them or synchronize all in one go. Furthermore, you may add, edit or delete tasks. The different tabs work as a filter for the list of the tasks. Favorites are all tasks that were synchronized within the last two weeks, but not today. Each tab shows only a specific task type as indicated by the symbol. The green double-arrows stand for "Synchronizing". A blue arrow for "Copy", a blue arrow with a red plus for "Overwrite". You can change the type of a task by selecting a project, clicking on "Edit" and then clicking on the first page on "change". The other filter names are self-explaining. You will receive further help if you wait for a few seconds with the mouse cursor over a filter. In the task list a few more symbols are used. 1) At the left border, you can see two computers that are connected by an arrow. You can choose the look of the computers yourself in the task properties. The arrow symbolizes the task type. Normally you’ll see a green double arrow as a symbol for the synchronization. 2) Directly left of the last synchronization time, you may also see symbols. A clock will appear if this task is started by a timer. A green up arrows means that this task is executed at the Windows startup, a green down arrow stands for the execution on shut down. Hold the "Ctrl" key pressed while clicking to select multiple tasks.